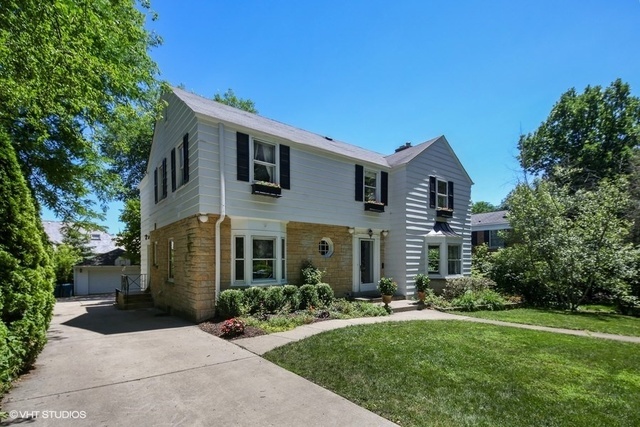 If you're looking for the perfect Hinsdale location that is move in ready, this is it! Steps to downtown, award-winning The Lane Elementary & train station, it is a commuter's dream. Inviting foyer with gracious staircase opens to expansive, elegantly appointed living room with fireplace, double French doors to Sunroom. Dining room with corner built ins & views of paver patio & huge landscaped yard. Remodeled kitchen features white cabinets, granite counters, stainless steel appliances, table seating & spacious pantry.1st floor office with bay window.Master Suite is a true retreat, his & her closets, walkout roof deck & newer master bath with his & her vanities. 2 large bedrooms with Jack & Jill bath; one with walk in closet, one with 2 double closets & walk out to roof deck. Hallway has walk in closet for more storage. Full finished basement (brand new carpet!) with recreation room great for keeping the kids busy, and a 4th bedroom.Huge Laundry/Mudroom with exterior access. Ogden south on Garfield to home. I was searching on Blue Fence and found this listing. Please send me more information about 423 North Garfield Avenue , Hinsdale, Illinois 60521. Thank you.